Wage inequality is a topic in elections around the world. What can be done to provide more income for those without jobs, and those with low wages? Wage inequality is really a sign of a deeper problem; basically it reflects an economic system that is not growing rapidly enough to satisfy everyone. In a finite world, it is easy for an economy to grow rapidly at first. In the early days, there are enough resources, such as land, fresh water, and metals, for each person to get a reasonable-sized amount. Each would-be farmer can obtain as much land as he thinks he can work with; fresh water is readily available virtually for free; and goods made with metals, such as cars, are not expensive. There are many jobs available, and wages for most people are fairly similar. As population grows, and as resources degrade, the situation changes. It is still possible to grow enough food, but it takes large farms, with expensive equipment (but very few actual workers) to produce that food. It is possible to produce enough water, but it takes high-tech equipment and a handful of workers who know how to use the high-tech equipment. Metals suddenly need to be lighter and stronger and have other characteristics for the high tech industry, thus requiring more advanced products. International trade becomes more important to be able to get the correct mix of materials for the advanced products needed to operate the high-tech economy. With these changes, the economic system that previously provided many jobs for those with limited training (often providing on-the-job training, if necessary) gradually became a system that provides a relatively small number of high-paying jobs, together with many low-paying jobs. In the United States, the change started happening in 1981, and has gotten worse recently. Figure 1. 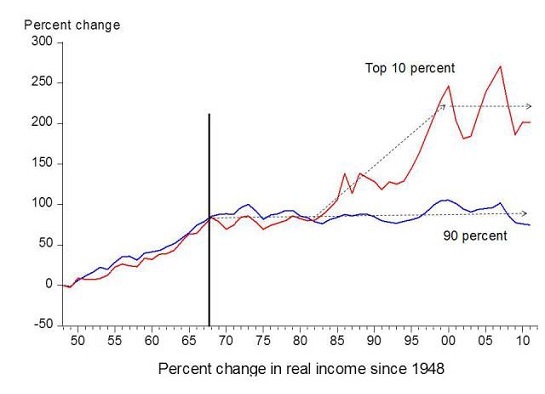 Chart comparing income gains by the top 10% to those of the bottom 90%, by economist Emmanuel Saez. Based on an analysis IRS data; published in Forbes. What Happens When An Economy Doesn’t Grow Rapidly Enough? If an economy is growing rapidly enough, it is easy for everyone to get close to an adequate amount. 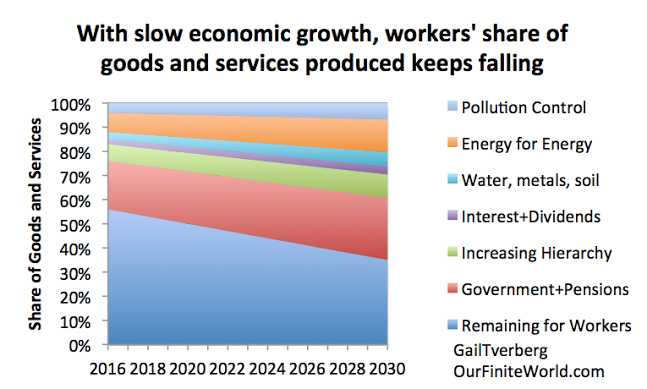 The way I think of the problem is that as economic growth slows, the “overhead” grows disproportionately, taking an ever-larger share of the goods and services the economy produces. The ordinary worker (non-supervisory worker, without advanced degrees) tends to get left out. Figure 2 is my representation of the problem, if the current pattern continues into the future. Pollution control. Pollution sinks are already full. Continuing to use non-renewable resources (including burning fossil fuels) adds increased pollution. Workarounds have costs, and these take an increasing share of the output of the economy. Energy used in energy production. When we started extracting energy products, the cheapest, easiest-to-extract energy products were chosen first. The energy products that are left are higher-cost to extract, and thus require a larger share of the goods the economy produces for extraction. Water, metals, and soil workarounds. These suffer from deteriorating quantity and quality, leading to the need for workarounds such as desalination plants, deeper mines, and more irrigated land. All of these take an increasingly large share of the output of the economy. Interest and dividends. Capital goods tend to be purchased through debt or sales of stock. Either way, interest payments and dividends must be made, leaving less for workers. Increasing hierarchy. Companies need to be larger in size to purchase and manage all of the capital goods needed to work around shortages. High pay for supervisors reduces funds available to pay lower-ranking employees. Government funding and pensions. Government programs grow in size in good times, but are hard to cut back in hard times. Pensions, both government and private, are a particular problem because the number of elderly people tends to grow. It should be no surprise that this type of continuing pattern of eroding wages for ordinary workers leads to great instability. If nothing else, workers become increasingly disillusioned and want to change or overthrow the government. It might be noted that globalization also plays a role in this shift toward lower wages for ordinary workers. Part of the reason for globalization is simply to work around the problems listed above. For example, if pollution becomes more of a problem, globalization allows pollution to be shifted to countries that do not try to mitigate the problem. Globalization also allows businesses to work around the rising cost of oil production; production can be shifted to countries that instead emphasized coal in their energy mix, with much lower energy used in energy production. With increased globalization, people who are primarily selling the value of their own labor find that wages do not keep up with the rising cost of living. Researchers Peter Turchin and Surgey Nefedov analyzed eight civilizations that collapsed in detail, and recorded their findings in the book Secular Cycles. According to them, the typical economic growth pattern of civilizations that collapsed was similar to Figure 3, below. 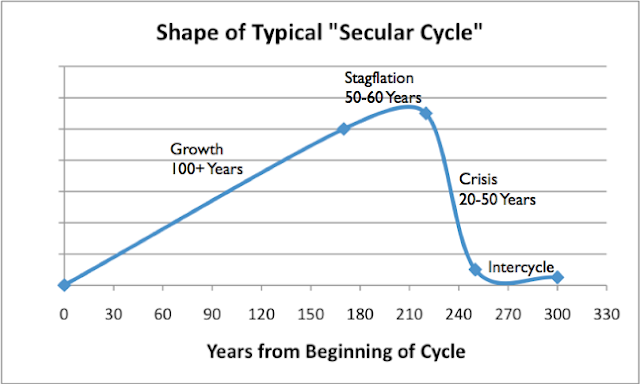 Before the civilizations began to collapse (Crisis Stage), they hit a period of Stagflation. During that period of Stagflation, wages of ordinary workers tended to fall. Eventually these lower wages led to the downfall of the system. Figure 3. Shape of typical Secular Cycle, based on work of Peter Turchin and Sergey Nefedov in Secular Cycles. Chart by Gail Tverberg. In many instances, a growth cycle started when a group of individuals discovered a way that they could grow more food for their group. Perhaps they cleared trees from a large plot of land so that they could grow more food, or they found a way to irrigate an area that was dry, again leading to sufficient food for more people. A modern analogy would be discovering how to use fossil fuels to grow more food, thus allowing population to rise. At first, population grew rapidly, and incomes tended to grow as well, as the size of the group expanded to the carrying capacity of the improved land. Once the economy got close to the carrying capacity of the land, a period of Stagflation took place. There no longer was room for more farmers, unless plots of land were subdivided. Would-be farmers were forced to take lower-paying service jobs, or to become farmers’ helpers. In this changing world, debt levels rose, and food prices spiked. To try to solve the many issues that arose, there was a need for more elite workers–what we today would call managers and high-level government officials. In some cases, a decision would be made to expand the army, in order to try to invade other countries to obtain more land to solve the problem of inadequate resources for a growing population. All of these changes led to a higher needed tax level and more high-level managers. What tended to bring the system down was the growing wage inequality and the resulting low wages for ordinary workers. Governments needed ever-higher taxes to pay for their expanding services, but they had difficulty collecting sufficient tax revenue. If they raised taxes to an adequate level, workers found themselves without sufficient money for food. In their weakened state, workers became subject to epidemics. Governments with inadequate tax revenue tended to collapse. Sometimes, rather than collapse, wars were fought. If the wars were successful, the resource shortage that ultimately led to low wages of workers could be addressed. If not, the end of the group might come through military defeat. Because of our depleted resources and because of the world’s growing population, the only the way the world economy can now grow is in a strange way that assigns more and more output to various parts of “overhead” (Figure 2), leaving less for workers and for unemployed individuals who want to be workers. Automation looks like it would be a solution since it can produce a large amount of goods, cheaply. It doesn’t really work, however, because it doesn’t provide enough employees who can purchase the output of the manufacturing system, so that demand and supply can stay in balance. In theory, companies that automate their operations could be taxed at a very high rate, so that governments could pay would-be workers, but this doesn’t work either. Companies have a choice regarding which country they operate in. If a tax is added, companies can simply move to a lower-tax rate jurisdiction, where no tax is required for automation. The world is, in effect, reaching the end of the Stagflation period on Figure 3, and approaching the Crisis period on Figure 3. The catch is that the Crisis period is likely to be shorter and steeper than illustrated on Figure 3, because we live in a much more interconnected world, with more dependence on debt and world trade than in the past. Once the interconnected world economic system starts to fail, we are likely to see a rapid drop in the total amount of goods and services produced, worldwide. This will produce an even worse distribution problem–how does everyone get enough? The low oil, natural gas, and coal prices we are now seeing may very well be the catalyst that brings the economy to the “Crisis Period” or collapse. Unless there is a rapid increase in prices, companies will cut back on fossil fuel production, as soon as 2016. With less fossil fuel production, the total quantity of goods and services (in other words, GDP) will drop. Most economists do not understand that there is a physics reason for this problem. The quantity of energy consumed needs to keep rising, or world GDP will decline. Technology gains and energy efficiency improvements provide some uplift to GDP growth, but this generally averages less than 1% per year. Figure 4. 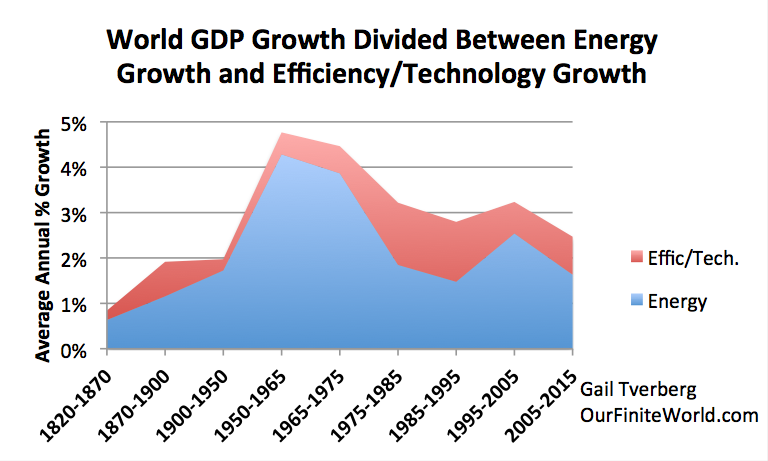 World GDP growth compared to world energy consumption growth for selected time periods since 1820. World real GDP trends for 1975 to present are based on USDA real GDP data in 2010$ for 1975 and subsequent. (Estimated by author for 2015.) GDP estimates for prior to 1975 are based on Maddison project updates as of 2013. Growth in the use of energy products is based on a combination of data from Appendix A data from Vaclav Smil’s Energy Transitions: History, Requirements and Prospects together with BP Statistical Review of World Energy 2015 for 1965 and subsequent. Are There Political Strategies to Solve Today’s Wage Inequality Problem? Unfortunately, the answer is probably, “No.” While some strategies look like they might have promise, they risk the possibility of pushing the economy further toward financial collapse, or toward war, or toward a major reduction in international trade. Any of these outcomes could eventually bring down the system. There also doesn’t seem to be much time left. Our basic problem is that the world economy is growing so slowly that the ordinary workers at the bottom of Figure 2 find themselves with less than an adequate quantity of goods and services. This problem seems to be getting worse rather than better, over time, making the problem a political issue. Provide a basic income to all citizens. The intent of this strategy is to try to capture a larger share of the world’s goods and services by printing money (or borrowing money), This money would hopefully allow citizens to purchase a larger share of the goods and services available on the world market. If the pool of goods and services is pretty much fixed in total, more goods and services purchased by one country would mean fewer goods and services purchased by other citizens of other countries. I would expect that this strategy would not really work, because of changing currency relativities: the level of the currency of the country issuing the checks would tend to fall relative to the currencies of other countries. The basic problem is that it is possible to print currency, but not goods and services. There is also a possibility that printing checks for everyone will encourage less work on the part of citizens. If citizens do less work, the country as a whole will produce less. Such a change would leave the country worse off than before. Lower interest rates, even negative interest rates. With lower interest rates, the interest portion of the Interest and Dividend sector shown on Figure 2 can theoretically mostly disappear, leaving more money for wages on Figure 2 and thus tending to “fix” the wage problem this way. Low interest rates also tend to reduce dividends, because companies will choose to buy back part of their stock and issue very low interest rate debt instead. If interest rates become negative, the sector can completely disappear. The ultra-low interest rates will have negative ramifications elsewhere. Banks are likely to have a hard time earning an adequate income. Pension funds will find it impossible to pay people the pensions they have been promised, creating a different problem. Get jobs back from foreign countries through the use of tariffs. Some jobs might be easier to get back from foreign countries than others. For example, programming, call center operations, and computer tech support are all “service type” jobs that can be done from anywhere, and thus could be transferred back easily. In situations where new factories need to be built, and materials sourced from around the world, the transfer would be more difficult. Businesses will tend to automate operations, rather than hire locally. The countries that we try to get the business from may retaliate by refusing to sell needed devices (for example, computers) and needed raw materials (such as rare earth minerals). Or a collapse may occur in a country we try to get jobs back from, so fewer goods and services are produced worldwide. Medicare for all. Medicare is the US healthcare plan for those over 65 or having a disability. It pays a substantial share of healthcare costs. The concern I have with “Medicare for all” is that because of the way the economy now functions, the total amount of goods and services that we can choose to purchase, for all kinds of goods and services in total, is almost a fixed sum. (Some people might say we are dealing with a zero-sum game.) If we make a choice to spend more on medical treatment, we are simultaneously making a choice that citizens will be less able to afford other things that might be worthwhile, such as apartments and transportation. The US healthcare system is already the most expensive in the world, as a percentage of GDP. We need to fix the overall system, not simply add more people to a system that is incredibly expensive. Free college education for all. As the situation stands today, 45% of recent college graduates are in jobs that do not require a college degree. This suggests that we are already producing far more college graduates than there are jobs for college graduates. If we provide “free college education for all,” this offer needs to be made in the context of entrance exams for a limited number of spaces available (reduced from current enrollment). Otherwise, we sink a huge share of our resources into our education system, to no great benefit for either the students or the overall system. We are back to the zero-sum game problem. If we spend a large share of our resources on college educations that don’t really lead to jobs that pay well, more people of all ages will find themselves unable to afford apartments and cars because of the higher tax levels required to fund the program. Renewables to replace fossil fuels. Despite the popularity of the idea, I don’t think that adding renewables provides any significant benefit, given the scenario we are facing. Renewables are made using fossil fuels, and they tend to have pollution problems of their own. They don’t extend the life of the electric grid, if we are facing collapse. At most, they might be helpful for a few people living off grid, if the electrical grid is no longer operating. If the economic system is on the edge of collapse already, fossil fuel use will drop quickly, with or without the use of renewables. It would be really nice to “roll back” the world economy to a date back before population rose to its current high level, resources became as depleted as they are, and pollution became as big a problem as it is. Unfortunately, we can’t really do this. We are now faced with the question of whether we can do anything to mitigate what may be a near-term crisis. At this point, it may be too late to make any changes at all, before the downward slide into collapse begins. The current low prices of fossil fuels make the current situation particularly worrisome, because the low prices could lead to lower fossil fuel production, and hence reduce world GDP because of the connection between energy consumption and GDP growth. Low oil prices could also push the world economy downward, due to increasing defaults on energy sector loans and adverse impacts on economies of oil exporters. In my view, a major reason why fossil fuel prices are now low is because of the low wages of “ordinary workers.” If these wages were higher, workers around the globe could be buying more houses and cars, and indirectly raising demand for fossil fuels. Thus, low fossil fuel prices may be a sign that collapse is near. One policy that might be helpful at this late date is increased focus on contraception. In fact, an argument could be made for more permissive abortion policies. Our problem is too little resources per capita–keeping the population count in the denominator as low as possible would be helpful. On a temporary basis, it is also possible that new programs that lead to rising debt–whether or not these programs buy anything worthwhile–may be helpful in keeping the world economy from collapsing. This occurs because the economy is funded by a combination of wages and by growing debt. A shortfall in wages can be hidden by more debt, at least for a short time. Of course, this is not a long-term solution. It simply leads to a larger amount of debt that cannot be repaid when collapse does occur.